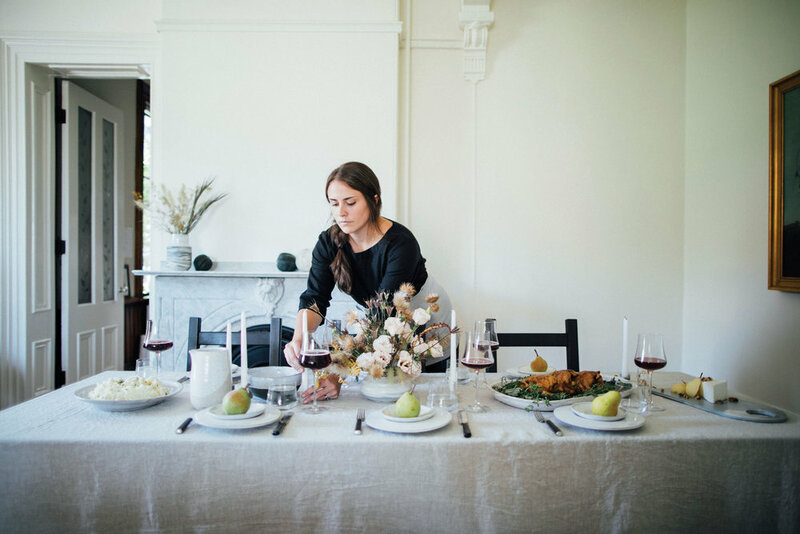 In preparing the menu, the team carefully considered ease of preparation in order to create an environment where the chef could enjoy the present moment of the gathering. Each of the recipes below can be largely prepped ahead of time and easily finished in a pinch. This light and aromatic dish makes a wonderful cheese-and-fruit appetizer or dessert. Combine the wine, sugar, lemon zest, lemon juice, peppercorns, cloves, and cinnamon stick in a medium saucepan. Cut the vanilla bean in half lengthwise to reveal the seeds. Using the tip of a paring knife, scrape the seeds out and add them and the emptied pod to the wine mixture. Mix using a wooden spoon. Slowly bring the mixture to a strong simmer over medium-low heat. 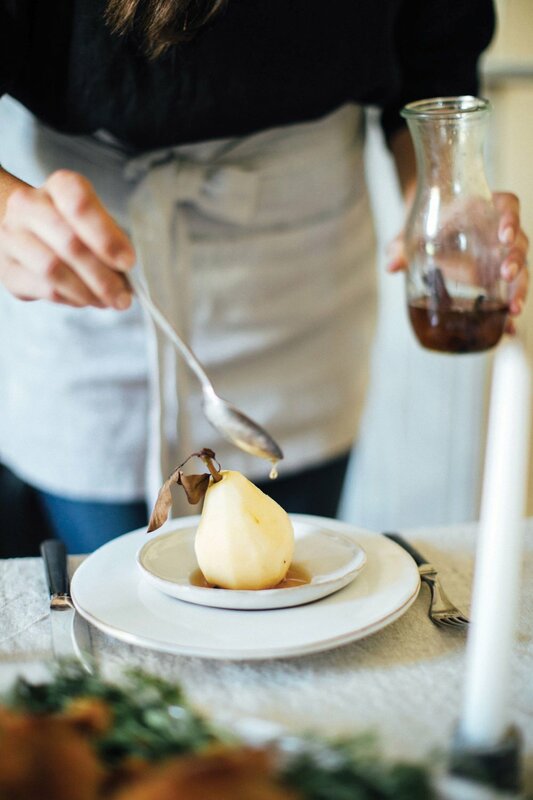 Using a slotted spoon, one-by-one slide the pear halves into the simmering mixture and cook for 10 minutes. Turn the pears over and continue to cook for 10 minutes, or until a toothpick can be inserted into the pears with little resistance. Carefully remove the pears from the mixture and set them aside. Turn the heat up to medium high and boil the wine mixture for about 10 minutes, or until reduced by half. Strain the mixture through a fine mesh strainer into a bowl and discard the spent spices. Serve the pears in a shallow bowl or on a cheese board. Add ricotta salata and chopped walnuts. Spoon the reduced and strained wine mixture lightly over the top. Roasted garlic and fresh thyme elevate this classic mashed potato dish with a seasonal twist. Fill a large pot with chopped vegetables and water to cover. Bring to a rapid boil and cook for about 10 minutes, or until vegetables easily slide off a fork. While the vegetables are cooking, heat 2 tablespoons of butter in a small saucepan over medium heat until just melted. Add thyme leaves and cook for about 2 to 3 minutes, or until aromatic. Remove from the heat. Once cooked, drain the vegetables and immediately add the remaining butter and heavy cream to the warm pot and melt them slightly. Add vegetables, thyme, the butter infusion, salt, and white pepper. Remove and add the individual pods from the 3 roasted garlic heads. Mash until smooth. Preheat oven to 400 degrees. Cut garlic in half widthwise, so that the pointed top is removed. Each garlic pod should be exposed. Arrange the bottom halves tightly together in aluminum foil, using a big enough piece of foil to form a packet. Generously drizzle oil over each head. Sprinkle the salt over them and loosely close the packet. Place the garlic in a baking dish and cook until soft, about 1 hour. After 1 hour, open the aluminum packet and continue to cook the garlic until it’s golden brown, about 15 to 20 minutes. If the packet gets dry during baking, add more oil. Let the packet cool fully before handling. This dynamic salad satisfies all the senses, from the balance of sweet and salty flavors to the creamy and crunchy textures. In a small saucepan, bring the balsamic vinegar to a simmer over medium-low heat, stirring frequently. Cook for about 20 minutes, or until the liquid is reduced by half. The glaze should be thick, but easy to stir. Mix in warm water and remove from the heat. Preheat your oven to 350 degrees. Cut an X into the top of the figs, starting from the stem down, being careful not to cut all the way through to the bottom of the fig. Squeeze to open slightly. Arrange the figs on a baking sheet. Scoop a small portion of blue cheese and lightly press it into each open fig. Bake for 5 to 7 minutes, or until the cheese begins to soften. 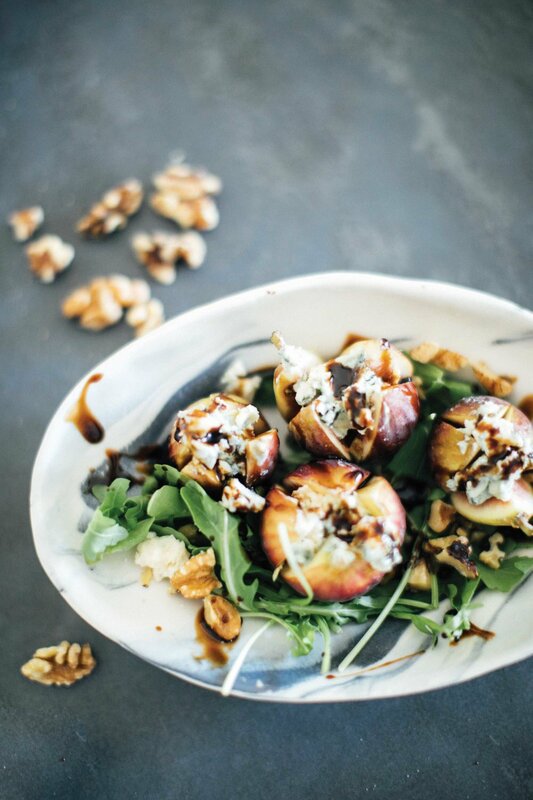 Arrange arugula on plate followed by warmed figs, and carefully sprinkle walnuts over top. Gently pour balsamic glaze to dress. Make this crust ahead of time and keep in the refrigerator for two days or in the freezer for two weeks. The extra chilling and freezing steps help maintain the integrity of the crust for blind baking. Whisk egg yolk, cream, and vanilla together in a bowl. Set them aside. Process flour, cocoa, sugar, and salt together in a food processor, until just combined, about 3 to 5 1-second pulses. Add the butter evenly atop the combined mixture. Pulse until just combined, about 10 to 15 pulses. It should be rough in texture. With the processor running, add the egg mixture. Mix until a ball forms. On a piece of parchment paper, roll the dough ball into a thin layer, about 12 inches in diameter. Chill rolled dough for about an hour. Remove from the refrigerator and once slightly warm enough to manipulate, evenly and carefully press the dough into a tart pan. Remove any excess dough. Freeze the dough for 30 minutes. Preheat oven to 375 degrees. Spray aluminum foil with baking spray and press the foil onto the dough, carefully covering the edges to prevent burning. Fill with beans or pie weights and bake for about 30 minutes, rotating at 15 minutes. Remove the weights and foil carefully and bake for an additional 5 minutes. Let the crust cool completely before adding the filling. This easy filling can be made the day-of in a pinch or prepped ahead of time and stored in the refrigerator for up to two days. Over medium heat, bring the cream, vanilla bean and seeds to a simmer. Immediately turn off the heat and remove the vanilla bean. Add the chocolate and butter. Cover and let melt for about 3 minutes. Gently whisk until just combined. Stir in Grand Marnier. Pour tart filling into the fully cooked tart shell and refrigerate until firm, about 2 hours. Remove the tart from pan and garnish with lightly sprinkled cocoa, whipped cream, French macarons, or fresh berries. Warm the whole milk, ½ cup of heavy cream, and brown sugar in a saucepan on medium heat, stirring constantly until the sugar is dissolved. Whisk together the egg yolks, salt, and spices into a separate bowl. Slowly pour the heated milk into the egg mixture while whisking constantly to temper the yolks. Pour the mix into the saucepan and continue to simmer for another 3 to 5 minutes, or until thick enough to coat the back of a wooden spoon. Add the pumpkin puree, maple syrup, vanilla extract, and the remaining ½ cup of heavy cream into the mix and whisk until thoroughly combined. Sieve through a fine-mesh strainer to remove any lumps and refrigerate until cool. Once the mixture is cold, follow the directions for your specific ice cream maker to churn. After the ice cream is frozen, add the graham cracker crust swirl, then freeze the ice cream for another 2 hours, or until firm. Add the ingredients into a bowl and mix until well combined and enjoy.